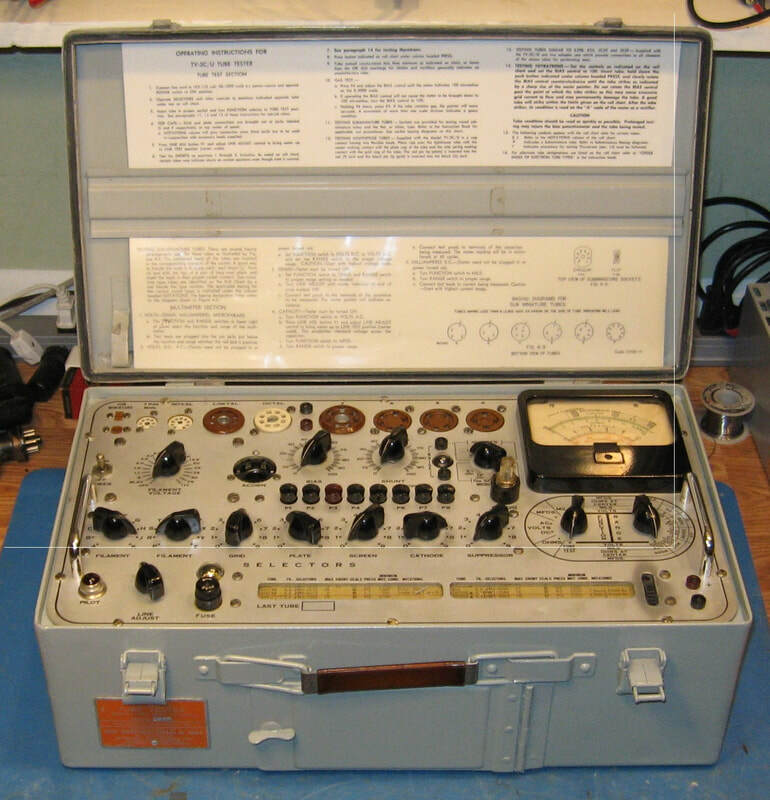 This military TV-3C/U tube tester has a May 1954 date stamped on the power transformer and was manufactured for the Navy by Jetronic Industries. It's a Hickok design and I've read online that the Hickok 547 and 548 test sets are more or less civilian versions of the TV-3. 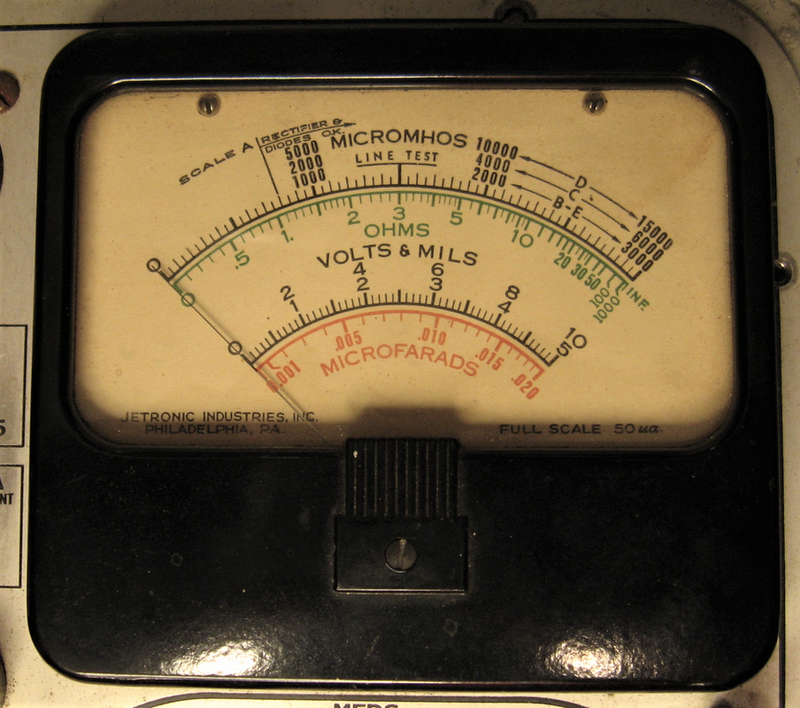 The TV-3 conveniently reads micromhos directly on the meter scales unlike the popular TV-7, and was superseded by the TV-10 in the early '60s. 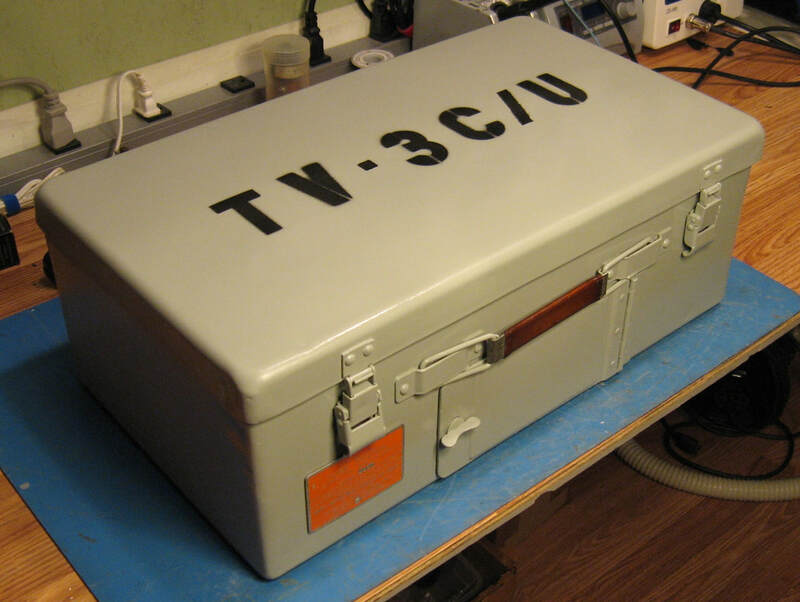 The TV-10 and TV-3 are similar but the TV-10 doesn't have the VOM functions, although it was updated with more sockets. 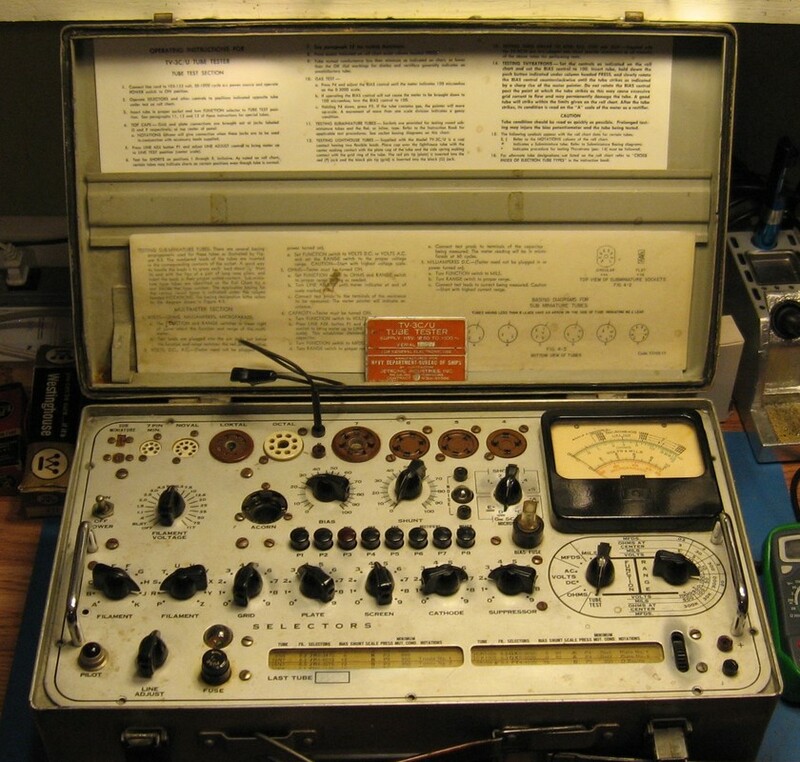 I had been looking for a high quality tube tester but did not want to pay the kind of prices a TV-7 or Hickok 539 command, so when I ran across this very capable tester for substantially less I snapped it up. It has comparable functionality to the higher-priced sets and will provide all the capabilities I'll personally ever need in a tube tester. This set was advertised as being in "very good working condition", but when I received it and made some initial checks I quickly discovered there was no plate voltage from the #83 rectifier. So much for working condition. 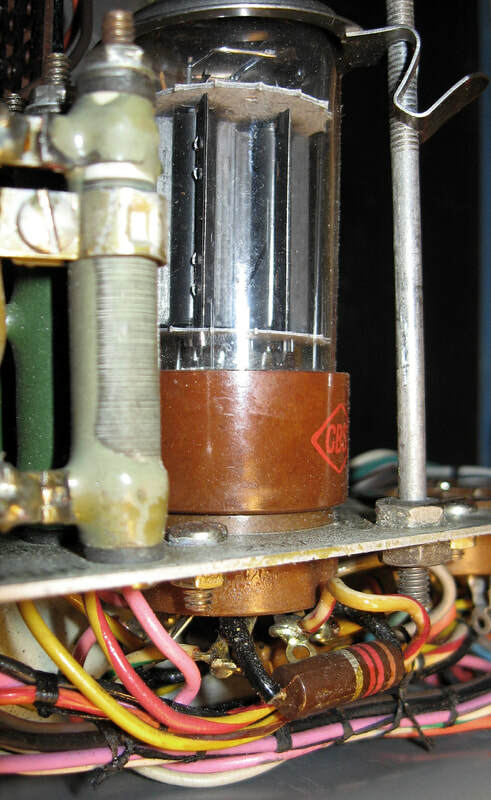 Fortunately the issue was just corroded pins on the 83 tube and after a quick cleanup I had plate voltage. ​Later, I discovered there was no bias voltage either, so not much of a chance this thing was working when sold. Another issue was glaringly obvious as soon as I opened the box and got an up close look at the tester - it's mounted in the wrong case. It's so blatantly obvious only an eBay seller could miss seeing it. The lid doesn't close completely down over the front panel because it hits the front panel handles. And only a couple of front panel mounting screws can be matched up to threaded holes in the cabinet. This case is actually made for either an "A" or "B" model. The front panel of the earlier variants must be ever so slightly larger than the "C" because there's just no way to get all the screw holes in the "C" front panel to line up to the case holes. 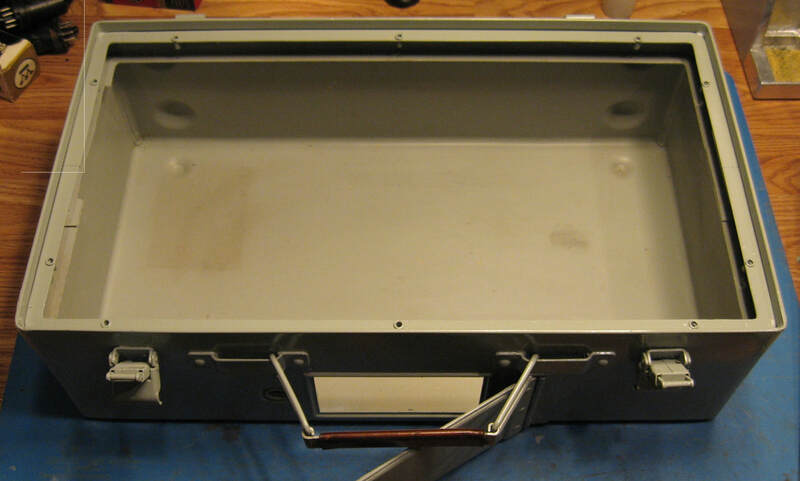 Plus there's an additional annoyance with the power transformer bumping up against an internal rib on the left inside of the case which doesn't allow the front panel to center up perfectly in the cabinet. The outside of the case had been stripped down to bare metal so it wasn't much to look at, and I was dismayed to see there wasn't a nomenclature plate on it. But while digging through the storage compartment I was happy to find someone had tucked the nomenclature plate in there. That will go back on the case's front corner once it's painted. - cut a notch out of the left side internal rib where the power transformer was hitting, so the front panels centers up. - remove all the crimp nuts in the top flange of the case for the front panel mounting screws and fill the holes with epoxy. - drill new holes to match the "C" front panel hole pattern and crimp in new 6-32 nuts. - remove the two handles from the front panel, and using sandpaper and a wood block, sand off about an 1/8" from the handle bottoms. They're chromed brass so not too hard to sand down. This was enough to allow the lid to close properly. - repaint the cabinet exterior. The interior had not been stripped and I left it in original condition. In the photos it's easy to see how the mounting holes will not line up. The second photo is after removing the crimp nuts and filling the holes with epoxy. It still needs sanded so new holes can be marked and drilled for the new nuts. The roll chart is not dated but has part number A-594-1153 and says TV-3C/U on it. Making a guess that 1153 might indicate a date, it could be the original chart. It's still in good condition, although someone has penciled in some tube settings in the spaces at the bottom provided for that purpose. 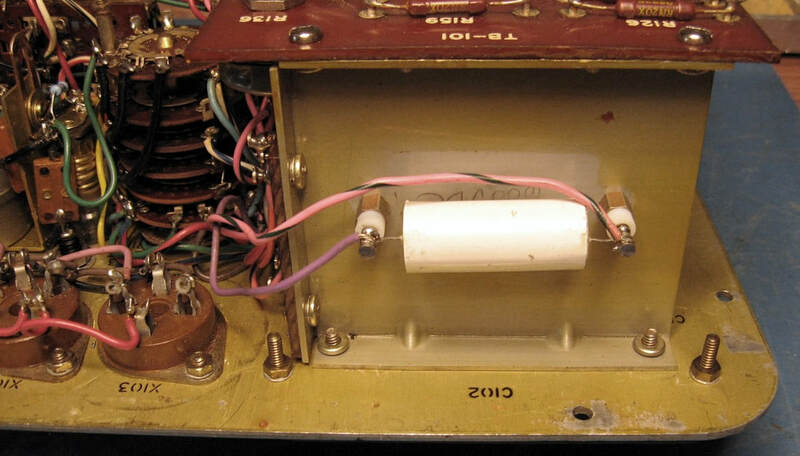 There are two fuses holders on the front panel of the TV-3C. One is for the Line and the other is for the Bias supply. 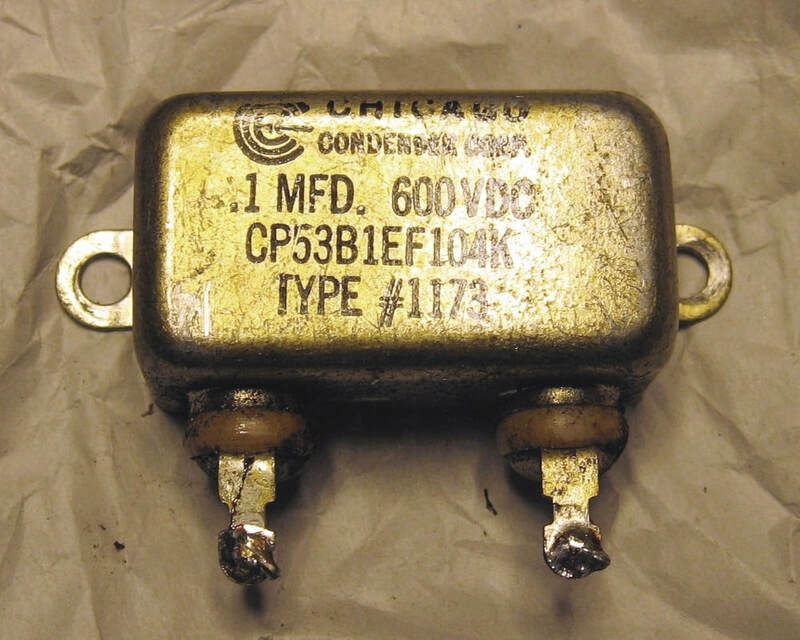 Fuses are added to equipment to protect it, a fact that seems to be lost on some people. The AC line fuse in this tester is supposed to be 1.5A but someone installed a 5A fuse, over 3X too high. 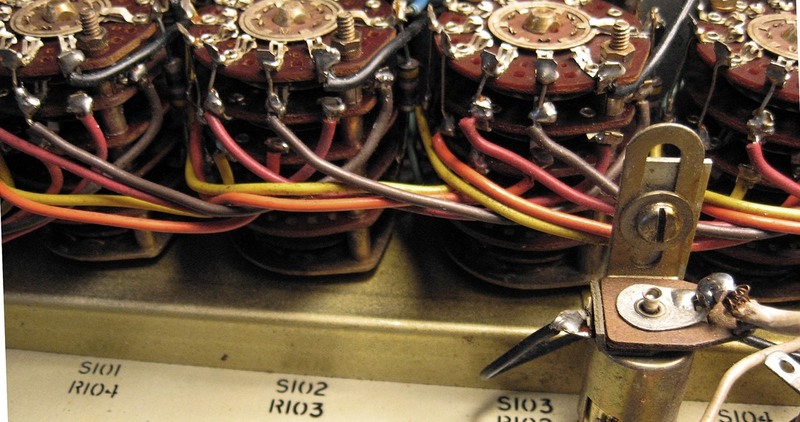 Likewise, the Bias fuse is supposed to be 125ma but there was a 2A fuse installed. That's 16X too high - the transformer winding would probably open before blowing a 2A fuse, which kinda defeats the whole purpose of having a fuse. The meter is in good shape and doesn't exhibit any nasty issues such as sticking. 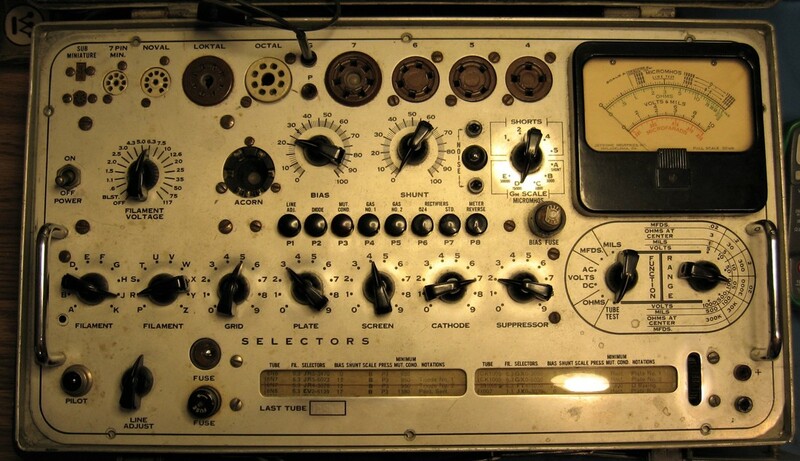 ​The VOM functions take up more real estate on the dial than the tube micromhos scales. This is a 1000 ohm/volt VOM so it might be useful when calibrating other tube testers, but otherwise I'm not likely to reach for a tube tester when all I want is a VOM. 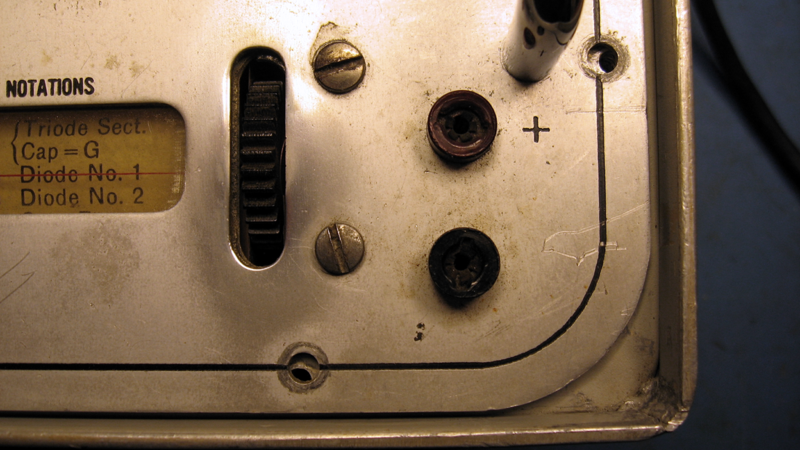 Most of the front panel screw heads are corroded and need cleaned and polished. Some are a pain to get at the nuts to take them out of the unit. The front panel appears to have some kind of clear coating on it which is pretty good at holding onto dirt. ​The tube socket contacts also need cleaned with Deoxit. ​And once again, it's easy to see how the panel screw holes don't line up. From the looks of the melted insulation and poor soldering on the Bias pot it is obvious someone has been tinkering inside. 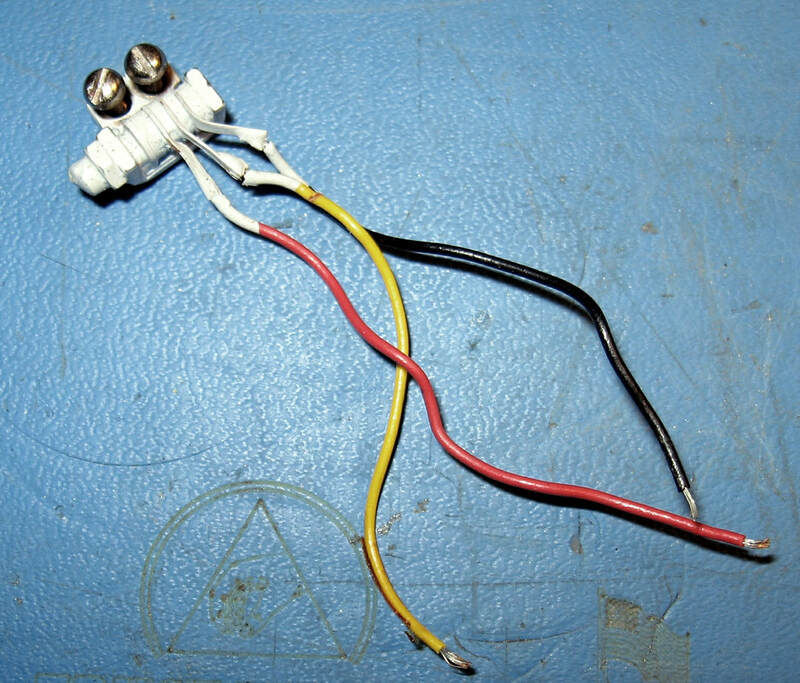 I unsoldered and checked the pot, trimmed up the melted insulation on the wires that were long enough to do so, added some insulated sleeves to the too-short yellow-striped wires which had been stripped backed too far, and then resoldered all the connections. I was curious why someone was checking the pot and as I began testing I discovered the reason. Although I thought I measured the -40VDC bias during the initial checks, when I started to calibrate the unit I no longer had any bias voltage. 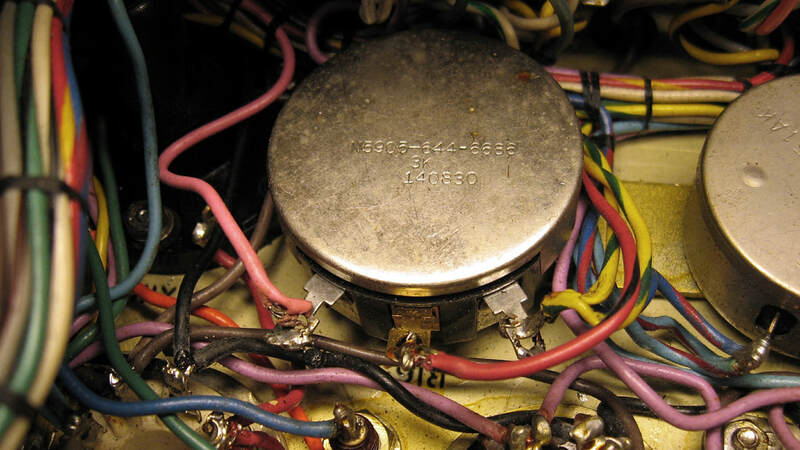 That's when I discovered that resistor R166, which is in series with this pot, was open. I couldn't find any damage to R166 but it is open in the middle of the resistor winding in two places. Interestingly, this dead area in the winding is exactly the width of the contact on the slider. And since the resistor is supposed to have two sliders, and one is missing, it's obvious someone was in here before me. I ordered a replacement power resistor online. 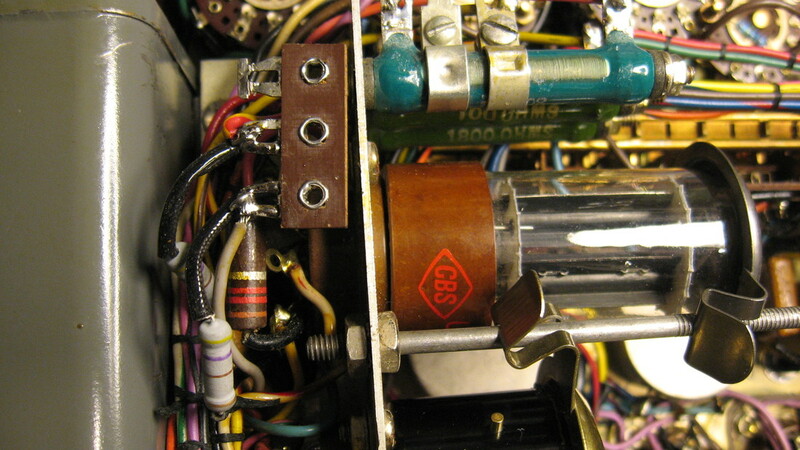 Also in the photo is the 5Y3 tube and below it a 1200 ohm resistor which is carbon composition. This resistor is one of the few composition resistors still in spec so I didn't bother to replace it. It's easy enough to get to if it ever does need changed. The 5Y3 is original and was tested to ensure it still has balanced sections. The R166 replacement showed up in just a few days from Surplus Sales of Nebraska. It is an 8K ohm adjustable resistor vice the 8.5K ohm original. It only came with one tap so I used the slider from the original resistor as the second tap. After installing R166 I found that setting the Line for a plate supply of 150VDC caused the 130VDC Screen supply to be at least 3V high using a #83 rectifier and 7V high with the solid state tube. This also made the Bias voltage and Low Screen voltage a little too high. The best way I found to get all the voltages in ​spec all at the same time was to add 470 ohm resistors in series with the 5Y3 plates. 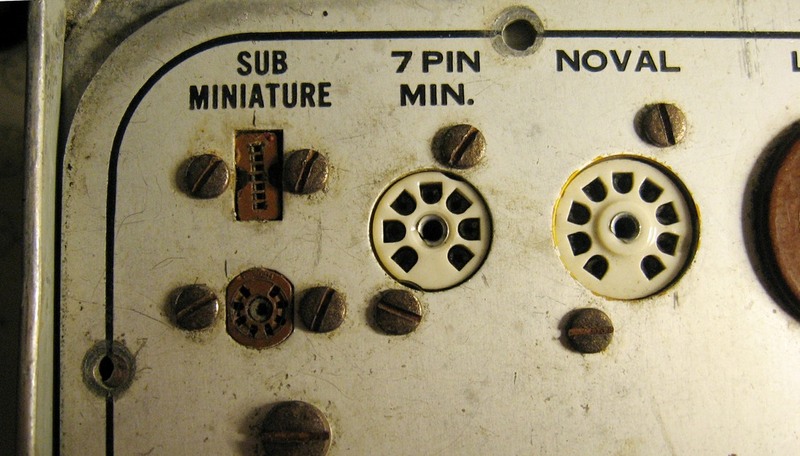 A small terminal strip was installed next to the tube socket for the resistors. The value was determined by substituting resistors in the circuit until I got the correct voltages. There are several other carbon composition resistors in the tester and most of these needed replaced because they've drifted high from age. 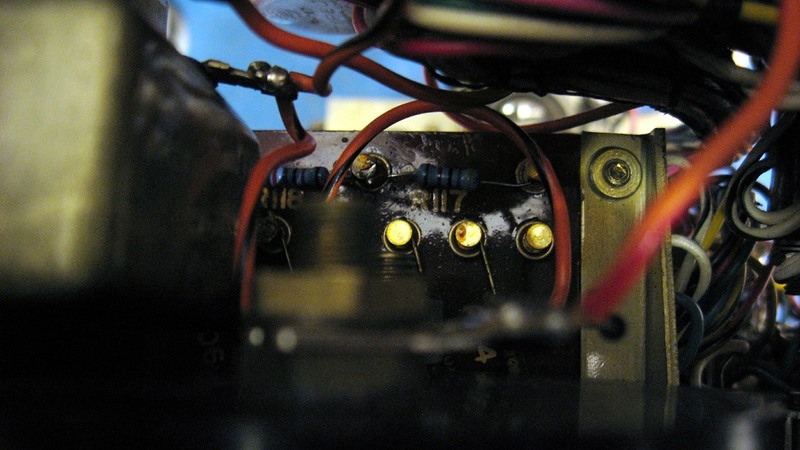 R102, R103 and R104 are 47-ohm resistors buried in between the selector switches and are a bit of a pain to replace. Only two measured high but I replaced all three while I was in there. They're on S101, S102 and S103. I also replaced R116 (330K) carbon comp resistor on the neon lamp, and R101 (1Meg) resistor on S107. And resistors R117 (47K) and R118 (27K) are also out of spec and need replaced. They are buried in the unit on the hidden side of TB102 and were replaced at the same time I replaced the 100uF meter capacitor. I had to remove the meter to get at some screws that need to be removed to get into the area where R117 and R118 are, and also to get at the nuts on the screws for the two bathtub capacitors. Military stuff is well built, but they can really stuff a lot into a small space at times. The bathtub for the 100uF capacitor is on the inside of the aluminum mounting plate and the 0.1uF capacitor for the shorts test circuit is mounted on the outside. 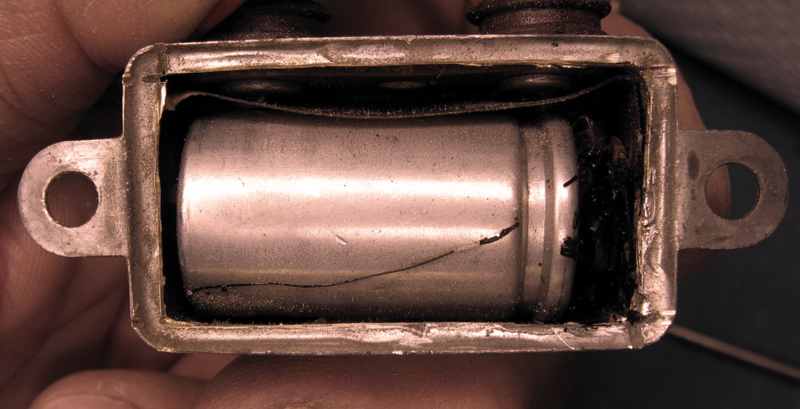 The bathtub for the meter electrolytic capacitor is not oil-filled, so I cut the back out of it with a dremel and replaced the cap inside. Once remounted it still looks original. 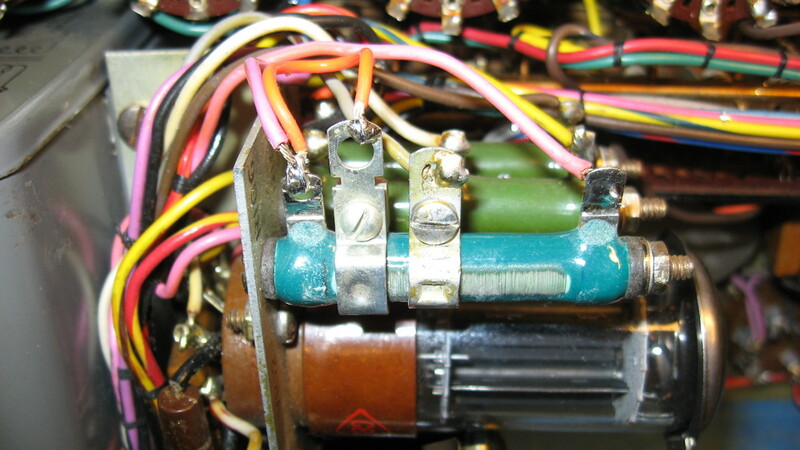 Two threaded binding posts were added in place of the nuts for the meter capacitor mounting screws and used to mount the replacement capacitor. Another carbon composition resistor is R119 (180K) on the P5 Gas 2 switch. It checked OK so wasn't changed. 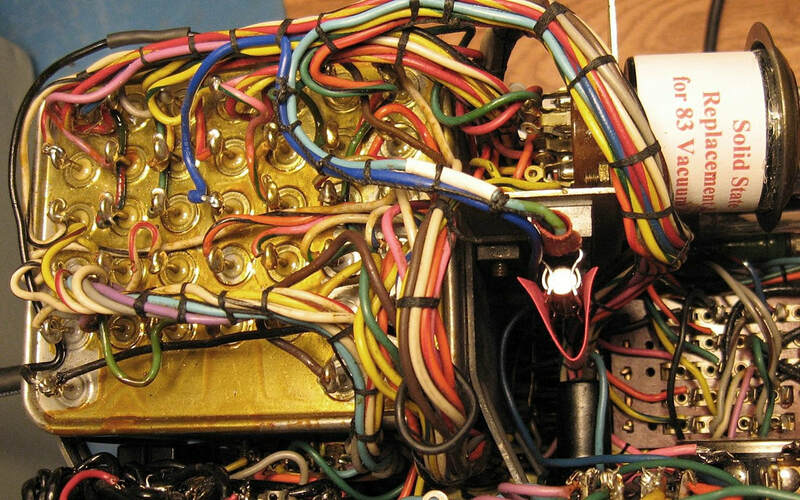 Gotta look close to see it hiding in the switch wiring. 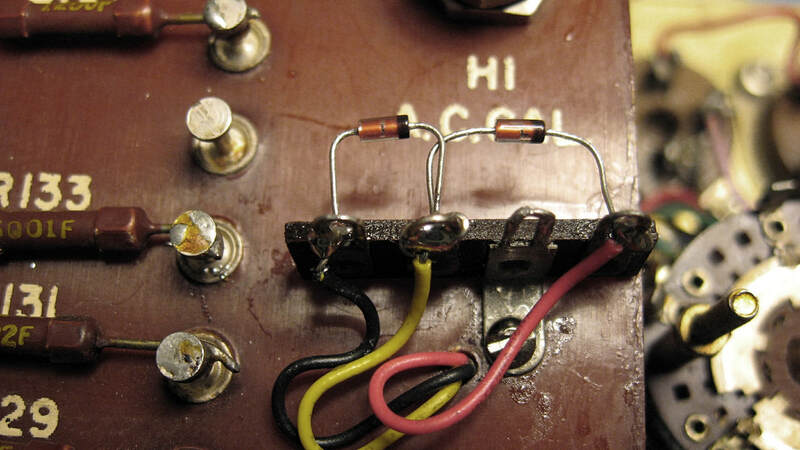 The line meter circuit wasn't reading correctly and I thought it might be the copper-oxide rectifier, so I pulled it. Turns out it was probably still serviceable. 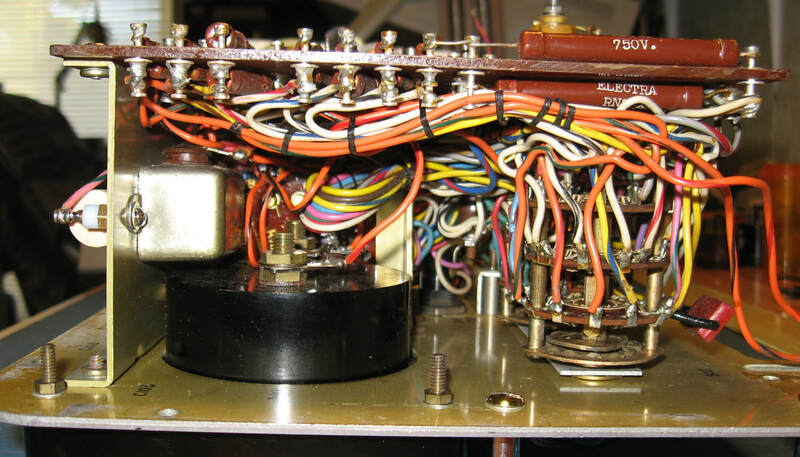 The forward readings are around 800 ohms, higher than the 500 ohms max stated in the manual but probably still usable, and the reverse readings were good at about 40K ohms on both diodes. It's obviously aged, but it is 63 years old. ​The real issue was that I accidentally used the wrong line test diagram, for a TV-10 which is a little different from the TV-3C, and didn't realize I needed to calibrate the AC Voltmeter. The TV-3C actually uses the 100-volt AC meter range to check the line voltage setting and these rectifiers are actually part of the AC voltmeter circuit. Since I had already pulled the copper rectifiers I replaced them with two 1N34A Germanium diodes mounted on a miniature terminal strip. 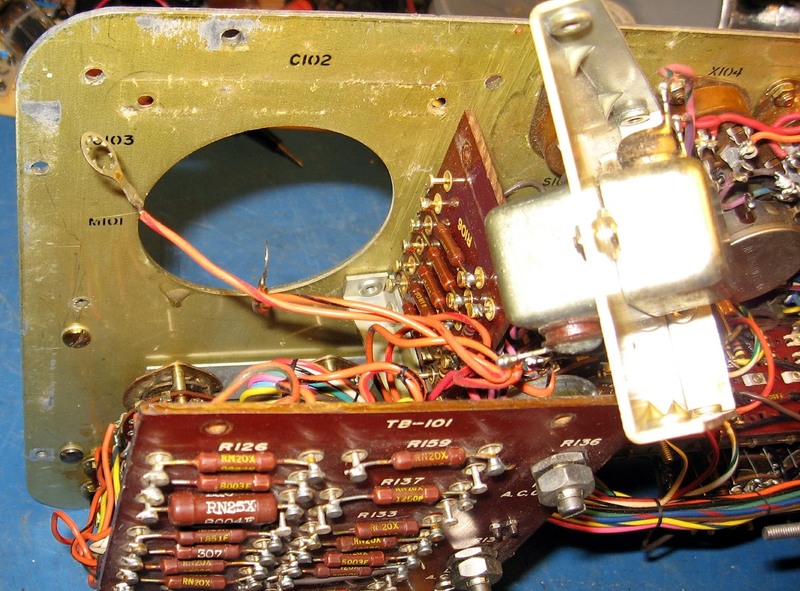 It was easier to mount the terminal strip on the top side of the TB101 and run the connecting wires through one of the mounting holes for the original rectifier. After replacing the diodes I followed the manual's instructions and calibrated the AC voltmeter. I wonder if they could have packed things in a little tighter? This is a side shot of the meter, meter capacitor, the terminal boards and the VOM and Function switches with all their associated wiring. 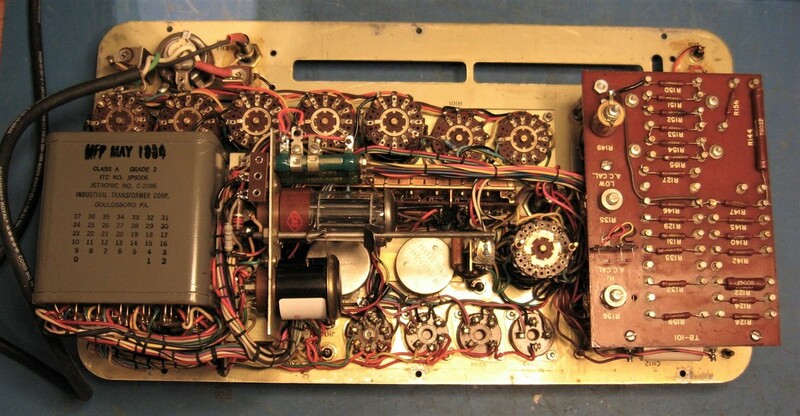 Internal view of the tester. I removed the tube roll chart while I was working on the unit and haven't reinstalled it yet. Just keeping it safe from accidents until it's time to go back in the case. 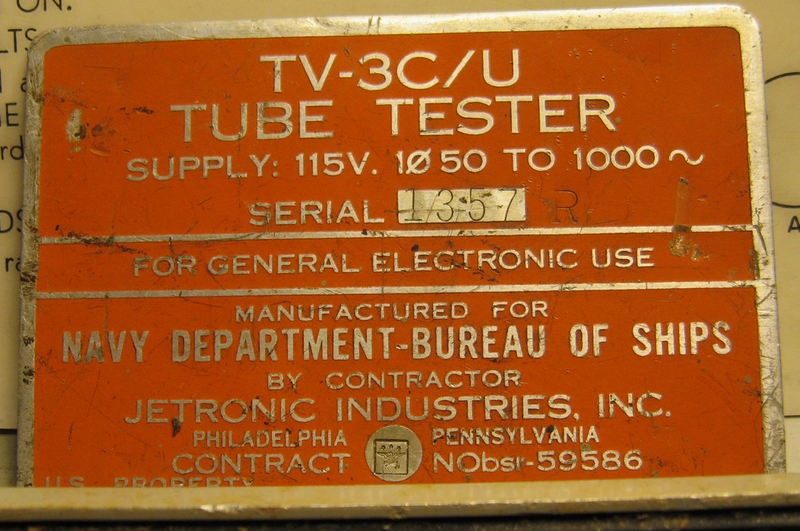 One last thing I almost forgot to do is add a fuse to the #83 tube high-voltage out line because I'm using a solid state replacement tube. 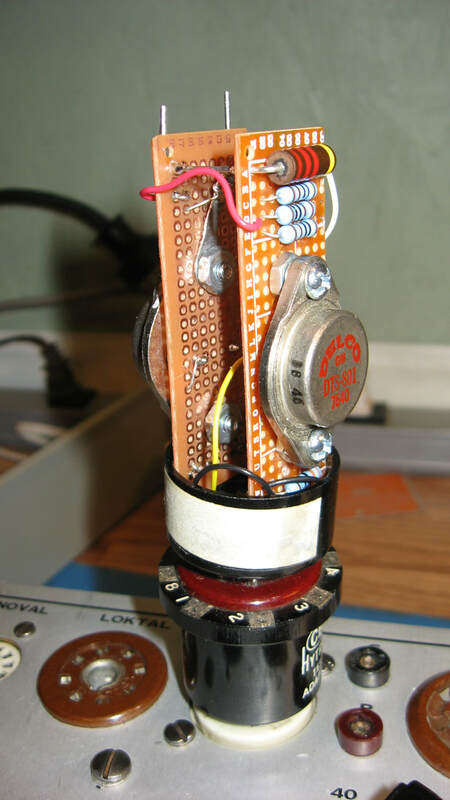 This protects against the possibility of a diode shorting. It's not likely but just in case. I removed the blue wire from transformer pin 20 and ran it to a fuse holder. 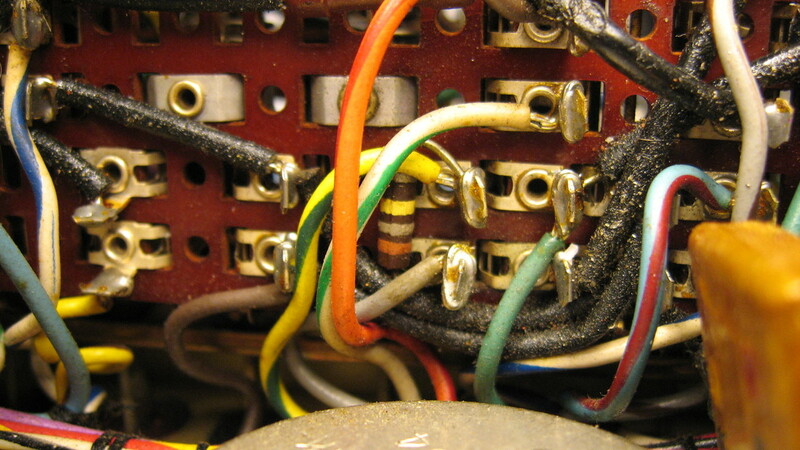 Then another blue wire was run from the opposite end of the fuse holder back to pin 20. I placed the fuse holder on the underside of the bracket that holds the tube sockets. The high-voltage winding is rated at 3A but I installed a 2A fuse to be on the safe side. I built a test fixture called an Alternating Current Sink to check transconductance accuracy. The ACS should ideally give a reading of 1000 uMhos on the B, D and E ranges and 500 uMhos on the C range. This TV-3 reads approximately 1000 - 1010 on the B, D and E ranges and it was spot on at 500 umhos on the C range. That's only about a max 1% error so I'm quite happy with the results. The ACS is detailed on the Alternating Current Sink page. The case after completing the modifications and repainting. 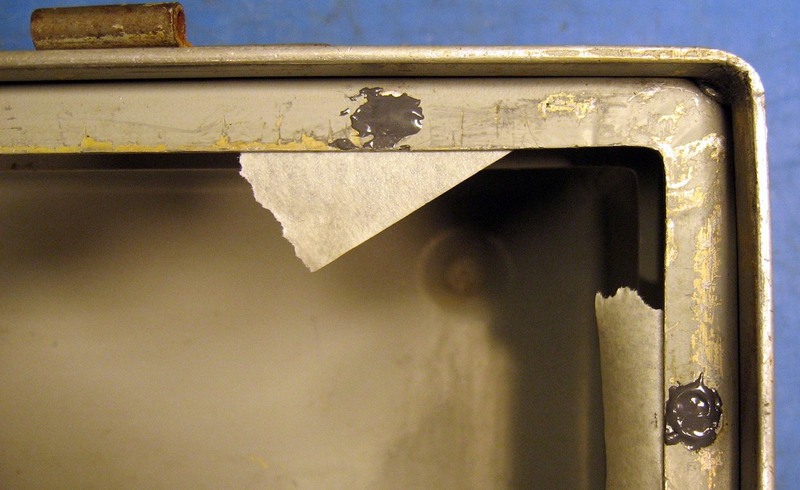 The inside was not repainted, just the top flange area and the outside of the case. The notch that was cut into the left side of the lower flange for the transformer is visible on the left. Finally, all back together again. The new paint job matches pretty well with the original paint on the inside. About as close a match as I was going to find off-the-shelf at the hardware store. The manual shows the nomenclature tag mounted on the left front and I attached it with automotive grade double-sided tape. I restenciled the top with a stencil set I found at Lowes. The lettering is a little larger than original but gotta use what's available. It's been a fun project but I'm glad to have it all cleaned up, put back together, and calibrated.